Note from Dave: Inventing teaching strategies is like playing the lottery: you may have hunches about which will make the biggest impact or (as a writer and PD leader) which will gain the greatest traction with fellow teachers — yet, ultimately, you have virtually no idea. Pop-up debate, then, has probably been my winningest lottery ticket. Over the past few years, incredible teachers around the USA and the world have used and improved upon it, and this school year I'm studying the pop-up method's effects on character through a national Character Lab Teacher Innovator Grant. It continues to surprise me and make me grateful. I'm not sure if Rebekah's newfound desire for a career in politics is something I should celebrate or mourn, but what I do know is that Rebekah is a zestier, more confident young woman, simply because she was given frequent opportunities to practice speaking in front of her peers. So: how do we move students from nausea-nervous to confident? And how do we do that without dismissing the introverts in our classrooms? First, let's examine the fear of public speaking and why I believe it's worth combatting, and second, let's look at exactly how I work to make the first pop-up debate a successful one. I was the shy kid in high school. When The Big Speech Unit came up in my freshmen English class, I was sick to my stomach for days. Even today, I'm the last person you should expect to volunteer to speak in a staff meeting or to pipe up when a presenter asks, “Are there any questions?” I'm just not that guy. In other words, I'm an introvert. I believe in the power of introversion. I've experienced firsthand how introversion can help you do things like build the blog you're reading right now. If I wasn't a nerd who enjoys large swaths of time in solitude, it would be way harder for me to sit and do the solitary work of writing. We live with a value system that I call the Extrovert Ideal — the omnipresent belief that the ideal self is gregarious, alpha, and comfortable in the spotlight. The archetypal extrovert prefers action to contemplation, risk-taking to heed-taking, certainty to doubt. He favors quick decisions, even at the risk of being wrong. She works well in teams and socializes in groups. We like to think that we value individuality, but all too often we admire one type of individual — the kind who's comfortable “putting himself out there.” Sure, we allow technologically gifted loners who launch companies in garages to have any personality they please, but they are the exceptions, not the rule, and our tolerance extends mainly to those who get fabulously wealthy or hold the promise of doing so. And yet — and yet! 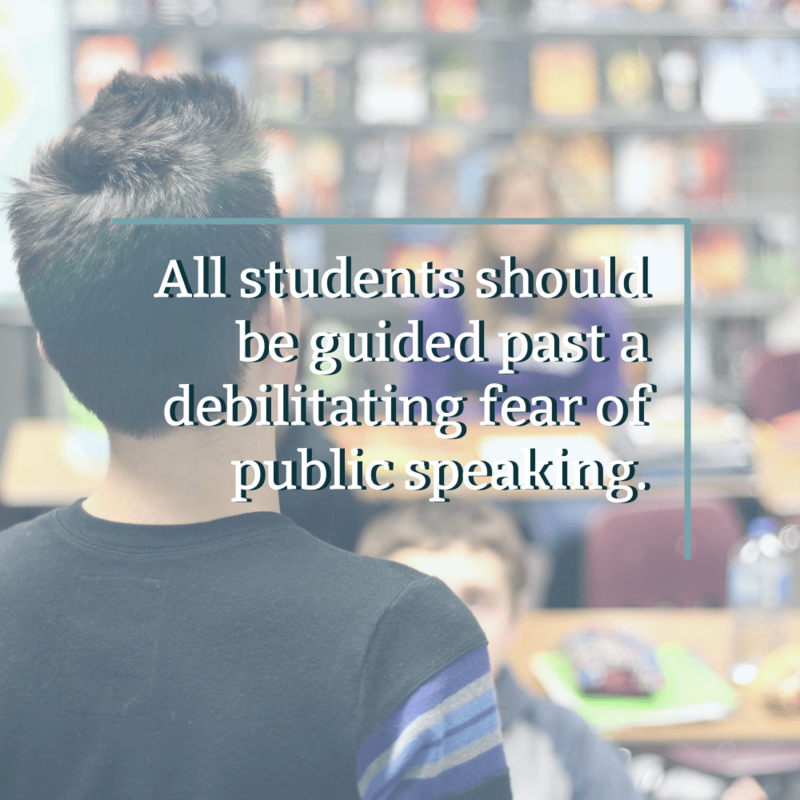 — I cannot allow my introverted students to leave my class with the belief that the fear of public speaking is an unconquerable peak. In my experience, being an introvert certainly does not mean that one cannot speak in front of others — it just means that the prospect of doing so is scary and exhausting. I don't know if it's possible for every person to completely rid themselves of a fear of public speaking. Last week prior to speaking to a high school staff in Semmes, Alabama, my heart was racing uncontrollably as the principal introduced me; I still don't sleep great on the eve of an engagement. And this is after speaking at over 50 sessions and events in the past three years. Yet I do teach every school year with the belief that it's possible for all of my students to get to a place where the fear no longer rules them. I believe that all of my kids, including the sick-to-their-stomach Rebekahs, can use a year of pop-ups to learn how to speak better in public (specifically) and how to overcome inner obstacles (more generally). Ever year, the National Association of Colleges and Employers conducts a survey asking employers to answer questions about what skills they desire in college graduates. Toward the top of the list each year are verbal communication skills. If I were to only get students to engage in a pop-up debate once per semester, my kids wouldn't get to work much on public speaking skills because public speaking would still be this huge, special deal — not a normal thing. Erik Palmer, author of my favorite teaching speaking book, argues that the only method for helping kids get better at public speaking and, in particular, poise (part of PVLEGS) is to give them experience. A key to developing poise is experience. The more they speak, the better students will be at leaving out the head flicking and shirt tugging [i.e., distracting, unconscious behaviors bred from nervousness]. This first pop-up debate, as you'll see in Part II of this post, is all about getting over the debilitating nervousness; every pop-up debate or discussion after that will be about improving elements of our speaking game. Overcoming the fear of public speaking helps my students with much more than public speaking. Let's imagine that Rebekah completely changes her career aspirations; she no longer wants to be in politics, but instead wants to be [insert the most non-social job ever here]. Even if this happened, I would not consider a single second of Rebekah's pop-up experience in my classroom to have been wasted. Why do I believe that all students deserve classrooms where public speaking is normalized? Because overcoming a powerful fear like public speaking teaches us that the things we fear don't kill us. After Rebekah stood up for the first time and spoke in a quavering voice with a flushed face, she sat down, watched and listened as others stood and spoke, and started to realize that the viscerality of the fear she felt before standing up didn't make it true. Through frequent pop-ups, Rebekah and classmates like her learn that fear, too often, is an internal construction and that conquering it is likewise an internal, winnable game. With all those things said, let's dive into the specifics for that first pop-up debate. It's critical to note that my first pop-up debate doesn't happen until about three weeks into the school year. This is because, in order for every other pop-up debate of the year to work, I need as many kids as possible (read: all of them) to stand up and speak during Pop-Up Debate #1. Every student stands up and speaks. For the Rebekahs in your classroom, this is a huge goal. Once this happens, you can begin to work on specific skill improvement — until this happens, all they can see and experience is fear. Every student shares a claim. It won't be students' first exposure to claims (that starts on Day 1), and it won't lead to a very exciting debate (or even a debate at all; imagine 30 students standing up, speaking a claim, and sitting down again — that is not a debate). Every student must speak at least one time, at most two times. To speak, simply stand up and speak. The first person to do so has the floor; when more than one person stands up, cordially and smoothly yield the floor. The teacher doesn't serve as “Who gets to speak” referee. For the sake of keeping the debate as lively as possible, the teacher may, at any point in the debate, call upon students who haven't spoken yet or open the floor up to all students, even those who have already maxed out their speaking turns. Prior to the first pop-up debate, my students have three weeks of Think-Pair-Share (which I wrote about last week). Randomized calling during the Share mode of Think-Pair-Share serves a crucial role: it teaches shy students that they don't die when their voice is heard by the whole class. To help students who don't know what to say, there's only one content requirement: make a claim. Prior to the debate, all students write a full paragraph explaining their answer to the debate question, and they then underline the claim sentence. All students are given the option at this point to read their claim directly from their paper. To help students organize their thinking, I provide sentence templates. Many kids are afraid of public speaking because they don't want to sound dumb. Simple templates like those in Graff and Birkenstein's They Say, I Say allow my students to package their ideas effectively. No cross talk. It's critical for our nervous students that pop-up debates are well-managed affairs — and this means that students only speak when they've stood and gained the floor. No winners. I haven't experimented extensively here, but I've done enough tinkering over the years to know that A) when I select a winner, at least a few kids grumble their way out of class at the end of the period, whereas B) when I don't select a winner, most students are reliving great moments in the debate or arguing about who won. I like the outcomes of B) better, not because I think competition is evil, but because I want my students to do as much arguing as possible. Interrupt only a handful of times and only to point out great moves. As the year progresses, interrupt with critiques. But for this debate, point out only positives, especially those positives that get at skills you hope all students will develop by the end of the year (e.g., paraphrasing, poise, beginning-middle-end, disagreeing agreeably). Call on students who don't stand up on their own. Unless your kids are way different than mine, you'll get to the end of the debate, you'll look down at your clipboard, and you'll see that at least a few students haven't stood up yet. Give them a few seconds to do so, but then just call on them: not with disappointment or irritation, but just matter-of-factly. Don't make a big deal of it — you can even be looking at your clipboard as if it is entirely routine for this to happen. The key is, you need those hesitant kids to stand up and speak. Be creative and kind toward that end. What did we as a class do well in this debate? I'll take any questions or comments you might have in the comments section below. To learn more about the pop-up method and to support this blog, check out my $1 Pop-up Debate Starter Kit. When I say “all students,” I'm obviously not referring to students who are unable to speak in front of their peers due to medical issues, IEPs, 504 plans, etc. Thank you to Jerry Graff for sending me down the argument road several years ago, and to Erik Palmer for making clear the simple power of normalizing public speaking in our classrooms. I will be giving professional development all next week and already my heart quivers with nervousness. I thank you for your transparency and for sharing with students the gift of beating the fear out of public speaking. It’s a game changer. Oh Tracey — I’ve felt that quiver lessen over the past few years, but so far from going away. I rarely eat breakfast before a day of PD because I have no appetite. Hi Dave! I love your point about being kind and creative in your efforts to get all students to speak, especially the examples of what not to do. I’ve seen students shut down and refuse to participate simply because of a negative vibe a well-intentioned teacher unknowingly projected. As teachers, we cannot forget what it was like to be adolescents. And as you pointed out, many of us still suffer from varying degrees of stage fright as adult professionals. Yes — those of us who were nervous as adolescents have a little bit of an edge relating to our students who have similar fears and worries. Thank you, Andrea! I have many students who adamantly refuse to do what I’ve asked them. Asking them to answer in class – nope, asking them to speak in class at all – nope. Is it too soon or are they just too uncomfortable in the environment? Dani, I have been there. I don’t know when you started school, so I’m not sure if it’s too soon. By the end of the first week of school, I want to have Think-Pair-Share normalized, and during that Sharing part I’m randomly calling through all of my kids, prompting them kindly to share what they spoke about with their partner. Many kids will try “I don’t know.” I say that they don’t have to know exactly, but they have to show some thinking. Keep in mind that I’ve been working on getting all kids speaking for three years — and that I don’t try mastering 100 things as a teacher, but really only about five things (see my recent post “3,500 Teachers Can’t Be Wrong…” I used to have far fewer students participating, but over time I’ve learned how to increase the odds that a kid will talk. All I’m saying is, give yourself credit for trying, and *keep trying. * You are doing *good work* when you seek to have all of your students speak in front of their peers. Be encouraged, Dani. I mean it. Richard, I did see that — thank you so much for the write-up! Keep up the great work over there at your site; I love the name. Heather, I want to be in on that debate! I’m so glad you’re reading AQWF; that makes me want to include it in my World History class this year, as, for the first time ever, I don’t have an English class on my schedule (hence a “normal” chance to read AQWF with the kiddos). You, like all great teachers, saw a problem, went with a mixture of your gut instinct and your mental teacher intentions, and made a great call. The great thing with pop-ups is that they are brief enough to allow us to do them again — and that “again” is where, as you’ve said, we get to focus on something else. Thank you for having a heart for your introverts; they need that! You’re going to be instrumental in changing some of their lives this year.